Pro Star Rental Texas Rents several types of scaffolding. We have provided this safety checklist for your convenience. This list is provided by the University of Oklahoma. Is the scaffold being erected under the direction of a competent person? Are all employees involved with (or near) the scaffold wearing hard hats? Are footings sound and rigid - not set on soft ground, frozen ground (that could melt), or resting on blocks? Is the scaffold able to hold four times its maximum intended load? Is the platform complete front to back and side to side (fully planked or decked, with no gaps greater than 1 inch)? Are guardrails and toeboards in place on all open sides? Are all sections pinned or appropriately secured? Is there a safe way to get on and off the scaffold, such as a ladder (without climbing on crossbraces)? Is the front face within 14 inches of the work (or within 3 feet for outrigger scaffolds? Does the scaffold meet electrical safety clearance distances? Is the scaffold inspected by a competent person before being put in use? If the scaffold is over 10 feet high, is personal fall protection provided, or are guardrails over 38 inches high? Are hardhats worn by workers on and around the scaffold? Are scaffold loads (including tools and other equipment) kept to a minimum and removed when the scaffold is not in use (like at the end of a day)? Are employees removed from scaffolds during high winds, rain, snow, or bad weather? Are materials secured before moving a scaffold? Are employees removed from the scaffold before they are moved? Are heavy tools, equipment, and supplies hoisted up (rather than carried up by hand)? 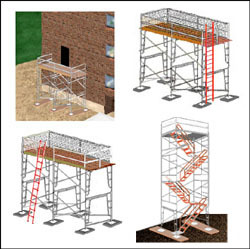 If you have any questions about the safe use of scaffolds, please contact EHS, X7241.